Intelligent system solutions are becoming a reality. 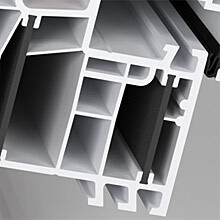 Lightweight structural elements, without steel reinforcements inside the profiles, which significantly limit energy losses in buildings are new arguments and benefits that aluplast offers to window manufacturers. 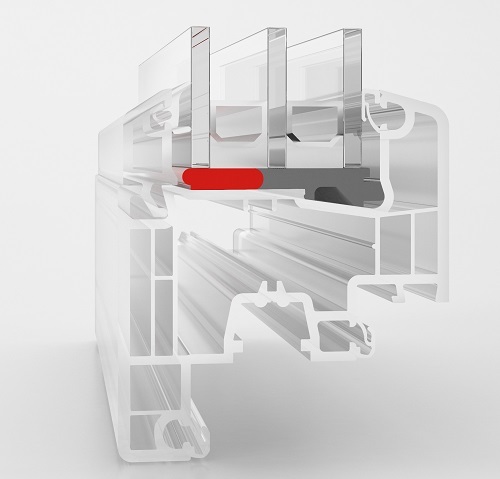 The energeto ® concept proposed by aluplast is a new way of thinking about energy efficiency, because it involves eliminating steel reinforcements used so far in profiles, which causes their thermal capability to be decreased. In addition, by implementing this technology, aluplast meets the expectations of manufacturers in the optimization of processes related to the production of windows. 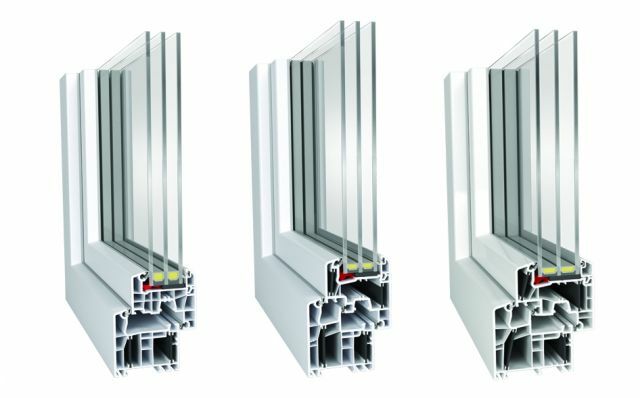 "powerdur inside" - a new type of frame, developed in cooperation with BASF with the use of Ultradur® High Speed plastic, which replaces steel reinforcements used in conventional frames. The aluplast solution enables the glass to be bonded to the wings without the use of previously needed steel reinforcements. The supporting function is taken over by the glazing unit. By bonding the glass to the profile, a significant portion of the static load is transferred through the window, which is more resistant to bending than the leaf profile, and thus stabilizes the window. Thanks to the constant connection of the pane and the wing, the risk of bending, twisting and sagging of the wing is reduced. This method minimizes the risk of window cracks due to point stresses and extends the life of the wings without the need of them being adjusted. Bonding the glass with the profile also means better protection against burglary due to the inability to push the glass out. 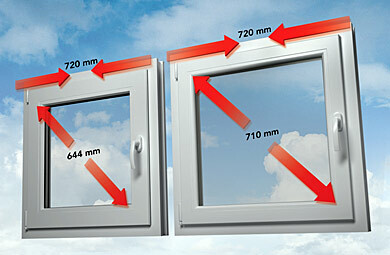 By changing the glazing technology it is possible to use the full depth of the glazing unit. Deeper embedment of the glass in the groove, leads to a reduction in the heat transfer coefficient of the thermal bridge occurring at the interface of the pane with the sash frame, which gives better protection against the formation of moisture on the edge of the glass. A significant reduction of the weight of the frame by as much as 60 percent, resulting from the elimination of steel is also of considerable importance. This definitely affects the comfort of work on the direct production points, as well as workers comfort involved in mounting windows at the construction site. 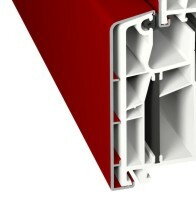 The lower weight of the entire window also has an impact on reducing the cost of transport. Beginning with the implementation of glass bonding technologies, actions aimed at eliminating the "weak link", which are from the point of view of thermal insulation profiles used in steel reinforcements, resulted in attempts to eliminate them completely from the sections. 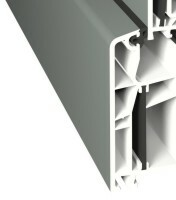 The metal stiffening in the profiles of the window frames creates a thermal bridge due to the high thermal conductivity. 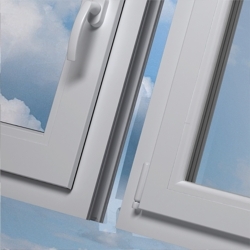 The glass fiber reinforced thermoplast replaces steel used in conventional PVC window frames and provides much better thermal insulation properties with the same mechanical properties of the window. The elimination of steel reinforcements allowed the elimination of thermal bridges and obtained the frame heat transfer coefficient to Uf = 0,94 W/m²K. It is worth noting that very high parameters of Uf = 1,0 W/m²K were obtained even at the standard profile depth of 70 mm. It can be seen, therefore, that the research carried out allowed for a significant reduction of the thermal insulation coefficients without increasing the depth of the sections. The desire to meet the demand for effective use of thermal energy from the sun in buildings has resulted in further changes in the construction of window profiles, consisting in lowering the height of the profile package. The elimination of steel reinforcements made it possible to develop a very narrow frame /sash construction with a width of only 107 mm. Thanks to a very interesting optics of the profile, characterized by a large overlap of the wings on the frame, larger glazing surfaces were obtained, which ensures better illumination of the rooms, as well as additional passive thermal gains thanks to appropriate windows. This is an ideal solution for the design of light-filled building facades, but also for renovations, where the glazing area is often reduced due to the replacement of windows. Energeto® systems are one of the few window systems that allow you to create so-called passive windows already using the basic double-chamber glazing unit with a heat transfer coefficient Ug = 0,7 W/(m2*K). This is possible thanks to the use of another technical novelty introduced, i.e. the "foam inside" technology, which consists in the option of filling internal chambers with insulation material. Thanks to the introduction of a special polyurethane foam into the chambers, it is possible to obtain extremely favorable values of the heat transfer coefficient. After filling the chambers of the profiles, a heat transfer coefficient is obtained up to Uf=0,79 W/m2K, which allows obtaining a coefficient for the whole window with Uw=0,61 W/m2K. The Institute of Passive Houses in Darmstadt has issued a certificate for the energeto® 8000/ foam inside window system that recommends them as a perfect solution for passive houses. Aluplast offers an optimal range of overlays in various colors for the new energeto® series, covering a spectrum of over 40 variants. These are overlays with the innovative cool-colors technology, which guarantees improved usability and longer surface durability. Cool-colors decors have special patented pigments that reduce the heat absorption of laminated window systems, which are more exposed to heat and weathering. This allows for optimal linking of functionality and design and allows designers and investors to implement their individual wishes. The extension of the decors program in the energy system takes into account the new trends and requirements of all markets. Aluminum overlays available for each system additionally multiply the number of possible color variants, allowing to obtain any color from the RAL palette. Possibility of further improvement of thermal permeability of profiles by optional filling, after the bonding process of the structure, the space of some internal chambers is filled with polyurethane foam using the "foam inside" technology. energeto® 8000 with a profile depth of 85 mm is specially designed for the new construction segment and convinces with top insulation values. The 85 mm system in Classic-line design with its clear straight lines is a real eye-catcher and, with an unparalleled Uf value of 0.94 W/m²K, an exemplary energy saver. 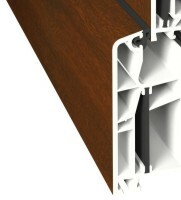 energeto® centre gasket system with a profile depth of 70 mm is irreplaceable in the renovation market. Restore and enhance old buildings with energeto®and benefit from top insulation values. The backstop gasket system energeto®4000 with a profile depth of 70 mm is mostly used in the renovation sector and allures with smooth, filigree profile lines that let more natural light into your rooms. Top insulation values ensure comfortable room temperatures. energeto profile series with extra thermoinsulative PUR foam filling.